Which Hot Tub Has the Best Warranty? Posted on August 4, 2017 , in Hot Tubs. No matter how high-quality your hot tub is, it will likely need professional repairs at some point. These repairs can be costly, but if you’re smart enough to choose a hot tub with a good warranty, you’ll be covered. Below, you’ll find out about what to look for in a hot tub warranty, who has the best warranty, and more. Any good hot tub manufacturer will have their manufacturer’s warranty posted on their website. If there isn’t a warranty posted, this may be a sign that the warranty is not good enough to advertise. If you don’t see one, contact the company to get a copy of the warranty. Make sure to read the warranty carefully and note any questions you have so you can take them to your dealer. There are several ways to determine whether a hot tub has a good warranty or not. The best warranty guarantees full coverage of the shell, equipment, plumbing, parts, and labor. In addition, if there are any exclusions or limitations, they should be clearly stated. Make sure you read especially carefully about exclusions so you aren’t surprised if you have an issue and something isn’t covered. If there are exclusions that seem like they could cost you a lot, it might be in your best interest to pass on this particular manufacturer. Who has the best warranty? Manufacturers with the best warranties also usually have stellar reputations. Unknown brands can be tricky investments because if the company is new, you can’t be sure that they will be around in a few years when you need parts or repairs. Make sure to do online research and read customer reviews of the company. If a company has been around for many years and has a strong customer base, it’s likely that their warranty will be very useful to you. Plus, they’ll likely be around when you need parts or repairs. There are a few things you should absolutely avoid in any warranty. The biggest of these is a warranty that is prorated. With a prorated warranty, you’ll have to pay for portions of the repair costs. Depending on the repair, this can become pricy. You should also try to choose a hot tub dealer with parts onsite. This will speed up your repair process. Finally, make sure you won’t be charged for travel to and from your home for repairs. With these tips, you’re sure to find a hot tub warranty that will protect you. 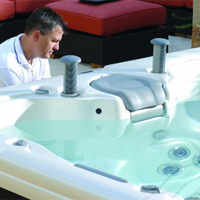 Next, download our buyer’s guide for a range of hot tubs with outstanding warranty options.